On May 1, BHP Billiton released the Environmental Impact Statement for its planned expansion of the Olympic Dam (Roxby Downs) uranium/copper mine in SA. A May Day protest was held to voice many members of the publics opposition to the mine and its expansion. · The mine operates under the SA Roxby Downs Indenture Act which exempts it from key environmental and Aboriginal heritage laws that apply everywhere else in SA. 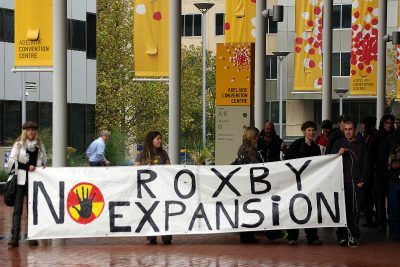 · BHP Billiton plans to make Roxby the largest open-cut mine in the world. Export of uranium is expected to increase from an average of 4,000 tonnes per year to 19,000 tonnes. Enough plutonium to build 2,850 nuclear weapons each year. · BHP Billiton proposes an increase in water consumption from 35 million litres daily (from the Great Artesian Basin) to 150 million litres daily (up to 42 million litres from the Great Artesian Basin, the remainder from a proposed desalination plant at Port Bonython). The total amounts to over 100,000 litres of water every minute of every day. · The production of radioactive tailings, stored above ground, will increase seven-fold to 70 million tonnes annually. The tailings contain a toxic, acidic soup of radionuclides and heavy metals. · Electricity demand for the mine will increase from 120 megawatts to 690 megawatts – equivalent to 42% of South Australia’s current total electricity consumption. Public meetings and protest against World Nuclear Fuel Cycle Conference a big success! A big thanks to those who came along to the fantastic public meetings in Sydney and Wollongong last week: hearing from Northern Territory Traditional Owners speak out against the proposed nuclear waste dump at Muckaty. The public meetings and protest of the World Nuclear Fuel Cycle Conference on Wednesday morning were fantastic! Below are two speeches from a public meeting at the Illawarra Aboriginal Cultural Centre on Dharwal country (Wollongong) on April 22, 2009. A couple of weeks prior to the meeting, a shipment of spent fuel rods from the Lucas Heights nuclear reactor had been transported in the dead of night through Wollongong to be taken out of Port Kembla in New South Wales. Dianne Stokes, Mark Lane and Mark Chungaloo (Traditional Owners of the proposed federal radioactive waste dump site at Muckaty in the Northern Territory ) were keen to meet with other communities affected by the Lucas Heights facility- if an NT dump is built then these fuel rods are eventually mooted to be dumped on their land. Politicians, Aboriginal leaders and environment groups have joined forces to protest against an international conference on the nuclear industry, currently meeting in Sydney. The coalition is also calling for an end to the Northern Territory radioactive waste dump proposal. Greens Senator Scott Ludlum says the Labor Party has had a year and a half in Government, but still has not dealt with radioactive waste management issues. He is calling on the Environment Minister Peter Garrett to consult on the issue. “It’s been an incredible disappointment to me that Peter Garett as Environment Minister has completely gone missing on this issue, and the Prime Minister has given the running of radioactive waste on uranium mining issues to Martin Ferguson, the Industry Minister,” he said. Dave Sweeney from the Australian Conservation Foundation says sustainable energy rather than nuclear power is the way forward. “There are jobs, dollars, export growth and the ability for this country to be a platform for a sustainable energy future,” he said. “Now we can be that, or we can cling to the coast and let our country become a quarry and the increasing pressure for material that goes out as ore to come back as waste to be perpetually stored here. Noisy protesters are targeting a global nuclear conference in Sydney, saying they want attendees to know they are not welcome. 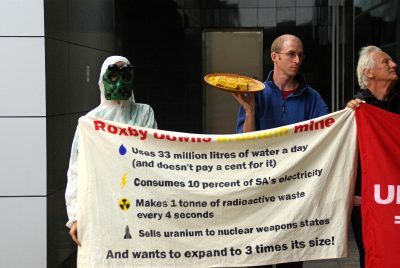 About 60 people from a group calling itself the Sydney Anti-Nuclear Coalition were on Wednesday demonstrating in front of the Elizabeth Street hotel playing host to the World Nuclear Fuel Cycle conference. The coalition is mainly made up of environmental, student and trade union groups. Police dragged several protesters away after they tried to get into the building and ordered the demonstrators to move on, but made no arrests. The conference is a nuclear fuel industry event, held annually at different locations around the world. Australian Conservation Foundation spokesman Dave Sweeney played down the scuffles and praised the group for braving the wet weather to turn out. “It’s been a bright and bouncy protest. It’s had a bit of passion as it should, because there’s high stakes here,” he said. Mr Sweeney said arguments that nuclear fuel was a green alternative to coal power were not acceptable. “You can’t call an industry that creates a waste that’s a carcinogen for 250 million years clean or green,” he said. “It (nuclear energy) is not going to ride over the hill as a white knight and save us, it’s not a solution to climate change. Greens Senator Scott Ludlam said it was important for people to voice their concerns about nuclear energy. 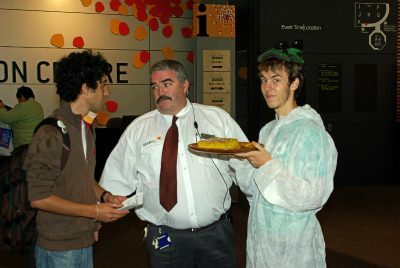 “The nuclear industry needs to know that wherever they set foot in Australia, we’ll have a presence,” Mr Ludlam said. The Australian Student Environment network is a member of the Australian Nuclear Free Alliance, an alliance of Aboriginal nations facing and fighting the nuclear industry and environmentalists and supporters. The Australian Nuclear Free Alliance (ANFA) has today dismissed moves by the Australian Uranium Association to reposition itself as the solution to systemic Aboriginal disadvantage through the formation of an Indigenous Dialogue Group. Late last year a detailed examination of hundreds of mining agreements by the Native Title working group found that less than twenty had brought significant benefit to Aboriginal communities. Formed in 1997, the Australian Nuclear Free Alliance brings together Aboriginal people and environment and public health groups concerned about existing or proposed nuclear developments in Australia, particularly on Aboriginal homelands. The Alliance provides a forum for sharing of knowledge, skills and experience and an opportunity to come together to protect country and culture from nuclear developments. We provide this service in response to the lack of free and informed consent and decision-making that is gripping the Impact Assessment procedures supposedly in place to regulate mining industries, and the pro-mining position taken by leaders within Native Title and Aboriginal Land Rights in Australia. The Alliance helped to build the successful campaign to stop the Jabiluka uranium mine in the Northern Territory, and more recently, a proposed national nuclear waste dump in South Australia. Information about the Alliance is posted at: <www.foe.org.au/anti-nuclear/issues/oz/alliance>.